Drywall is tricky and handling it is not for the faint of heart or the average DIY homeowner. Even if you feel that you’re experienced, it’s best to let professional drywall contractors take care of your needs! We, at Indigo Construction, know just how important your home is, and we have years of experience to get everything done for your project. Some contracting businesses that are just breaking into the industry only take on small projects, whereas, more established businesses are only willing to deal with larger projects. Fortunately, our contractors are well versed in all types of drywall construction, and we can take on any project– large or small! We understand that sometimes accidents happen with your drywall, so small repairs are necessary. This doesn’t mean you don’t deserve professional help. Additionally, our personnel are skilled and trained to take on massive projects to your satisfaction. If you have any sized project regarding your Sheetrock, just give us a call, and we are here for you! Repair work may seem easy, and for a professional it can be, but if your drywall needs to be patched, it’s best to let the experts handle it. When you hire our crew, you can rest assured that the new patch will make your wall as good as new, and it can blend in with the rest of its surroundings– regardless of texture. One great thing about hiring professionals is that we can create any texture on your gypsum boards that you can think of. As a homeowner, a remodeling project can take months of effort, but we can help! When you call us, you can rest assured that your walls will look perfect, and your remodeling efforts will go according to plan. Additionally, if your home has suffered any fire damage, we can help you with the restoration process. Fire can leave a smoke smell behind, but also obvious soot stains that are impossible to remove. If you need restoration help, let us do the job! Among homeowners, a level 4 or 5 smooth finish is starting to become the standard. This isn’t easily achieved, and no DIYer can pull it off. If you want your home looking great, call us! Ready to start? 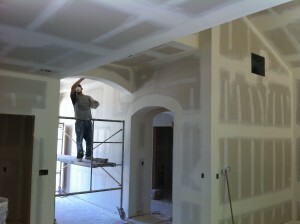 Call us right now for an estimate for your drywall project. Overall the job was well done. The patched area was blended very nicely. However, there were some issues with attention to detail. A few nail holes were left unfixed and a wrinkle in the tape was not repaired.